Christmas is coming! Everything has been in Christmas style except your iPhone handset? To welcome this big holiday season, we have collected a chunk of Christmas iPhone wallpapers HD/4K/Live to help decorate your iPhone. These selected free Christmas wallpapers for iPhone come with diverse themes and from different sources or apps, in case that you want to pick the specific Christmas background iPhone by yourself. How to Download Christmas Wallpaper for iPhone from Computer? 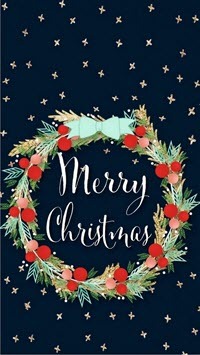 Have chosen a few Christmas iPhone wallpaper images from online sites on computer, but don't know how to put them on iPhone? DearMob iPhone Manager would be the helpmate to transfer Christmas wallpapers HD/4K/Live from computer to iPhone selectively or in batch. Fast and no quality loss. 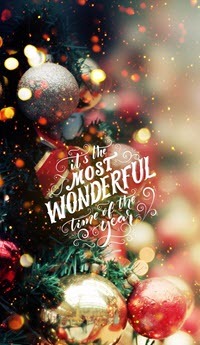 Here we'd like to provide examples of Christmas wallpapers for iPhone in different themes like Christmas tree, Santa Claus or golden deer that can perfectly match the holiday atmosphere, plus the source addresses for each type of iPhone Christmas background wallpapers for you to find more easily. The Christmas iPhone wallpaper apps we choose for you rank high on App Store, and will allow you to embellish your iPhone fast and directly of course. 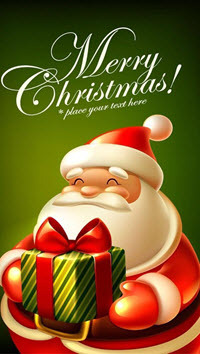 If you like the free Christmas wallpaper for iPhone we pick from online sites, we also list an iPhone photo transfer tool, DearMob iPhone Manager, to help transfer Christmas wallpaper HD/4K/Live from computer to iPhone, as well as transfer Christmas music for iPhone and make Christmas ringtone for iPhone to make your gadget livelier. How to Set Christmas iPhone Wallpaper? Before finding a free Christmas wallpaper for iPhone, you'd better know how large of your iPhone model image size, so that you can find the most proper Christmas background that perfectly matches your iPhone's screen. Actually, Google Images is the best way to find free Christmas wallpapers for iPhone easily and fast. However, when you search for Christmas iPhone wallpaper in Google, there are millions of pictures you can download to set as iPhone background wallpaper. Google also categorize some of them by type, but the results may not match your requirement. So, to help you find the Christmas wallpaper HD iPhone that perfectly matches your iPhone screen, we have done the job for you. [Notice!!!] Images downloaded from online sites may be subject to copyright, so do not use them for commercial purpose. To just name a few, other Christmas iPhone wallpapers also include animated Christmas wallpaper, merry Christmas wish wallpaper, funny Christmas wallpaper and Christmas iPhone Live wallpaper. You can put them in the search box of Google as well as Tumblr or Pinterest to find the type you like most. 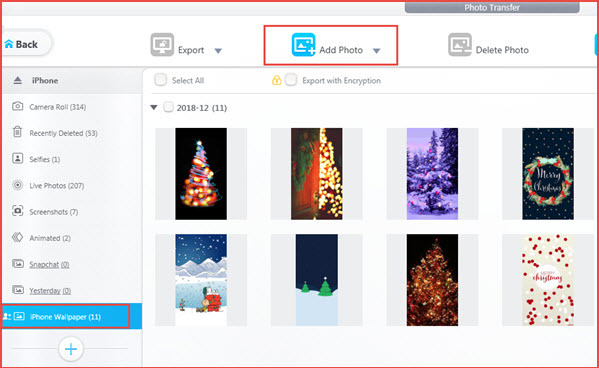 Once you have downloaded Christmas wallpaper for iPhone on computer, you need DearMob iPhone Manager to transfer the wallpapers to your iPhone so that you can make the background image available on iPhone. If you need a more convenient way, Christmas iPhone wallpaper app is a good choice. 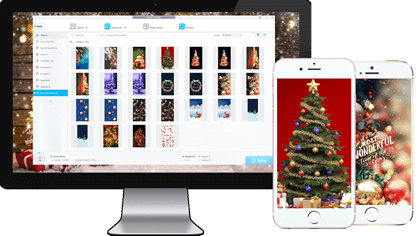 There are countable free Christmas wallpapers for iPhone, and only a few of them are highly-praised by users and offer updating free Christmas iPhone wallpapers. After comparison, we have selected two apps that may satisfy your needs as much as possible. This Christmas wallpaper HD iPhone app tries its best to offer the best themed Christmas wallpapers and backgrounds to beautify your iPhone handset. It is available for all of the iOS devices including the latest iPhone XS Max. The Christmas iPhone wallpapers are made to fit both the home screen and lock screen, so you can personalize your iPhone at will. Though it's a 2017 version that only for iOS 11, iPhone X/8/8 Plus, there must be one of the 10,000+ images amazes you. These Christmas iPhone wallpapers are themed by Santa, colorful Christmas trees, cute gifts and flashy lights, and all of them would help add some holiday elements to your iPhone. Worth mentioning, the most attractive feature of this app is that it allows for editing the Christmas backgrounds. Unfortunately, we didn't find an app that can enable you to download iPhone Live wallpapers for Christmas. Besides, most of the apps offer in-purchase option, which means that you have to pay some money for certain type of Christmas iPhone wallpapers. Though free Christmas wallpaper for iPhone app allows you to directly change your iPhone background, the limitations mentioned above have made it not that ideal. So, downloading Christmas wallpaper for iPhone from computer is much better regarding the image numbers, types and sizes. Type Christmas iPhone wallpaper in the search box of Google or other image sites, choose the wallpaper you love most, and then right click the image to save to your computer. As syncing pictures with iTunes will remove the existing synced images on iPhone, we choose a more considerate way to selectively transfer the downloaded Christmas iPhone wallpaper from computer to iPhone. That is DearMob iPhone Manager – a versatile iPhone photo backup transfer tool. 1. Download DearMob iPhone Manager, install and launch it on your computer. 2. USB-connect your iPhone to computer, and tap Trust to continue if your iPhone asks for. 3. Click-on "Photo Transfer" on the main UI of DearMob iPhone Manager, create a new album named iPhone Wallpaper or whatever by click on the "+" in the left menu. 4. Choose the album you just created and click on "Add Photo" on the top bar to choose the Christmas iPhone background wallpapers you downloaded on computer. 5. Click on "Sync" and DearMob iPhone Manager will immediately sync the wallpapers to your iPhone. Now that you have downloaded Christmas wallpaper for iPhone, just go to Photos on iPhone and find the wallpaper. Tap the arrow icon in the bottom of the screen and then swipe to choose "Use as Wallpaper" > Set > choose "Set Lock Screen", "Set Home Screen" or "Set Both". 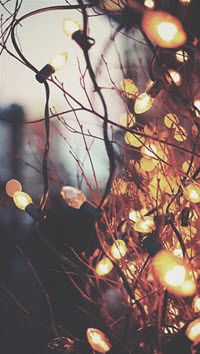 Now, your iPhone is enlightened by the beautiful Christmas wallpaper. You can change your iPhone wallpaper everyday without any cost as DearMob iPhone Manager allows you to import 3 pictures each day without penny. Also, no worries about the decreasing storage space, for DearMob iPhone Manager can delete the synced photos in batch at one stroke to free up the iPhone. If necessary, you are also supported to export iPhone photos to computer, convert HEIC to JPG, and turn iPhone Live Photo into video or still image.